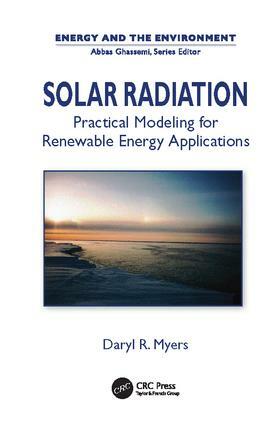 Written by a leading scientist with over 35 years of experience working at the National Renewable Energy Laboratory (NREL), Solar Radiation: Practical Modeling for Renewable Energy Applications brings together the most widely used, easily implemented concepts and models for estimating broadband and spectral solar radiation data. The author addresses various technical and practical questions about the accuracy of solar radiation measurements and modeling. While the focus is on engineering models and results, the book does review the fundamentals of solar radiation modeling and solar radiation measurements. It also examines the accuracy of solar radiation modeling and measurements. The majority of the book describes the most popular simple models for estimating broadband and spectral solar resources available to flat plate, concentrating, photovoltaic, solar thermal, and daylighting engineering designs. Sufficient detail is provided for readers to implement the models in assorted development environments. Covering the nuts and bolts of practical solar radiation modeling applications, this book helps readers translate solar radiation data into viable, real-world renewable energy applications. It answers many how-to questions relating to solar energy conversion systems, solar daylighting, energy efficiency of buildings, and other solar radiation applications.